Limited places, book your child’s place now! What is the Kids Surf Club? Bring your kids along for our fun, keep-fit and educational kids surf club! The Kids Club emphasis is on fun and fitness in a friendly environment all with fully qualified SGB & SLSGB instructors. Our instructors are also RNLI Lifeguards and are fully DBS checked and trained to work with children. The sessions will run for 2 hours in summer and 1 hour in winter, at the end of the season all attending students will be given a certificate of participation. All those that have attended 10 or more sessions will get a FREE Dexters Surf Club Hoody! Plus, if you’re joining us on our Saturday evening sessions throughout the summer, you’ll be able to join us at our beach chalet for a barbecue totally free of charge! These extra special lessons are designed with child participation in mind. These lessons provide them with an opportunity to learn beach safety, sea awareness skill, techniques for surfing, paddleboarding and kayaking – all in a fun and interesting way! Lessons are held in small groups of no more than 20 students, for maximum safety. Surfing takes place in shallow water, no deeper than the child’s waist depth, and we work with an absolute maximum of 1:8 (instructor to student) ratio. This ensures the club is safe and gives each child an equal opportunity to hone their skills with the instructor! We always start the session with a short 15 minute beach lesson and the rest of the lesson is in the water. We find this is the perfect amount of time to maintain their attention before they start getting too tired! The children are divided into groups according to ability and/or age, organised by our senior instructor Andy Des’a – Yorkshire’s only ISA Level 2 Coach. He also oversees safety and discipline when the session is lead by the other instructors. If you have any problems or concerns please speak to Andy (head instructor) or Luke (owner). Suitable surfing and safety equipment is provided to all students (soft surfboard, paddleboard, kayaks and a childrens wetsuit) with supervision at all times from our qualified surf instructors. If your child loves the water, is a confident swimmer and would like to join our Kids Surf Club use the ‘book now’ button or call 01723 377565 to talk to us. Have your session filmed from the sky! What should I bring with us? How old must my child be to attend? Does my child need to be able to swim? Will my child wear a lifejacket? Do I have to accompany my child? We provide everything else you need to have fun in the sea. We also have free to use showers, private changing rooms and lockers on site so you can get warm afterwards! We accept children aged 4 – 16 years. For insurance purposes, we cannot accommodate children under 10 years of age without a parent/carer staying with them. Children aged over 14 years of age may need to participate in our adult group lessons, which are more suitable for their learning and ability level. We have a minimum size wetsuit of JXS so if your child is a particularly small 4-year-old please tell a member of staff when booking. We reserve the right to refuse booking of any child who we believe to be under 10 years of age who or we do not think is suitable to partake in this course. We require our students to have a basic swimming ability. If your child is a non-swimmer or is not confident in the water, then please discuss this with staff BEFORE booking. We may be able to accommodate this, but we need to know in advance so we can make sure your child will benefit from the session. Lifejackets are not necessary for any our water based activities. Children are provided with a wetsuit which will keep them buoyant. 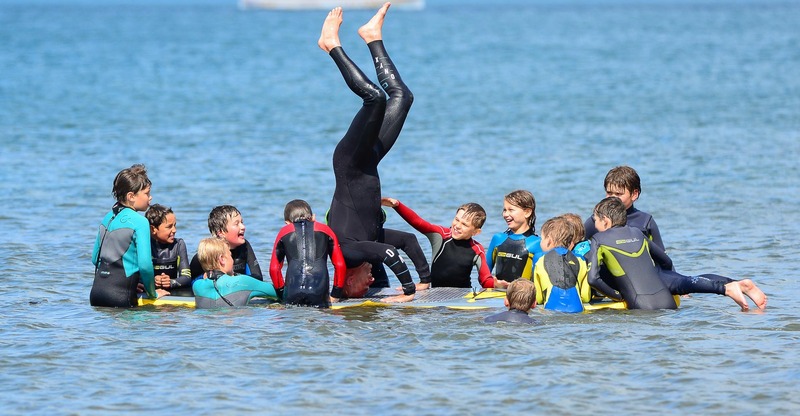 All our children’s lessons are conducted in water which is less than waist deep, with coaches who are qualified beach lifeguards and surf lifesavers. Children must be accompanied to and from the session and signed in and out by a parent/ carer. You do not have to stay if your child is over 10 years of age. 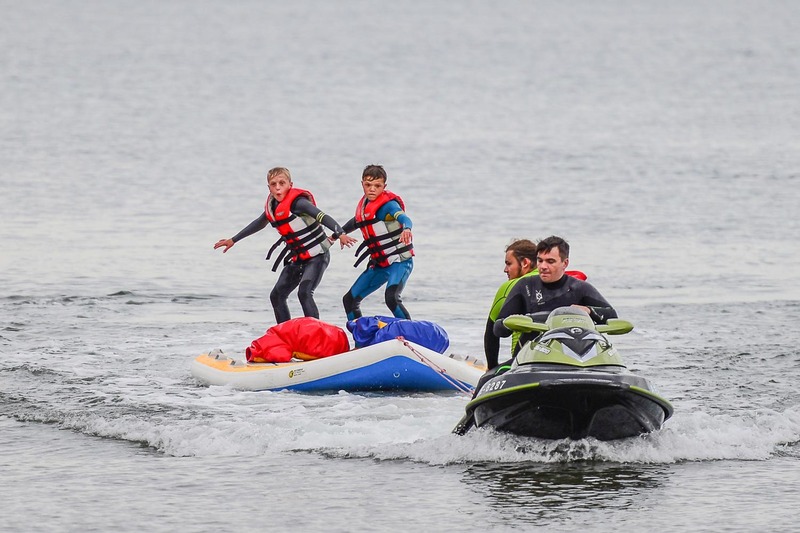 We do ask that all parents/carers are available at the beginning to help kids into their wetsuits and help them carry their equipment to and from the beach. You must be available at the end of the session to help your child change out of their wetsuit. Due to child protection laws, staff are unable to help your child with this alone.